The high-flying Oregon Ducks, alone in first place through the first three weeks of Pac-12 play and ascending rapidly on the national basketball scene, struggled mightily early in their game against Washington State Wednesday night at Matthew Knight Arena, and seemed ripe for their first defeat in eight contests. The Ducks sleep-walked their way through much of the first 20 minutes of play and fell ten points behind at the break as the visiting Cougars dominated nearly every statistical category. Oregon committed ten first-half turnovers, were out-rebounded 20-16, and played with very little energy, especially on the defensive end. The Cougars led comfortably 39-29 at the break, mainly because of Mike Ladd, who had 14 points, six boards, and five assists in the opening period alone. WSU knocked down 7 of 13 three-pointers in the period for a sizzling 54%. The Cougars spread the floor and shot wide open three-point shots consistently through the half. Oregon’s lack of focus and intensity on the defensive end contributed to the open looks. But, in a game of distinctly different halves, Oregon roared from behind thanks to the inspired play of their seniors, and pulled away for a 68-61 win over the game Cougars. The victory moves the Duck record to 17-2 overall, 6-0 in the Pac-12, while WSU drops to 10-9 and 1-5. While the entire squad was markedly improved in the second half, E.J. Singler and Arsalan Kazemi, in particular, ignited the team and the crowd of 6,946, which had been mostly subdued before intermission. Singler had 14 of his 19 points and four of his five assists after the break. Kazemi was only 2 of 7 from the field in the first-half with two rebounds, but finished with 16 points and seven boards. The Ducks scored the first nine points in the second half, drawing within one point of the Cougars at 39-38, less than 4½ minutes in. The last two points of the run came on a rim-shaking dunk by Carlos Emory that got the crowd roaring. After a timeout, WSU spread its lead back to six and quieted the crowd again before the Ducks fought back behind Singler. The senior then scored ten consecutive points, the last two at the free throw line to give Oregon its first lead of the game, 48-46, with 11:45 remaining. After that, WSU led just one more time, at 53-52, when Royce Woolridge rebounded a long Dominic Artis three-point attempt and scored on a breakaway layup at 7:40. But Oregon’s excellent defensive intensity, so sorely lacking in the first half, led the team to it’s 19th straight home-court victory, the sixth-longest streak in the country. After giving up 39 points in the first period, the Ducks only allowed 22 in the second. 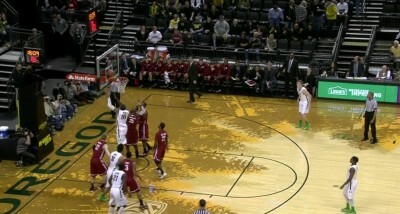 The Ducks salted away the game at the free-throw line, as they hit five of their final six shots down the stretch. Oregon came back to win the rebounding battle against the Cougars, 37-33, as Damyean Dotson led all players with nine boards. The Ducks improved their shooting from 38.5% at the half to 43.6% for the game. Oregon shot 71.4% from the free throw line, including 8/10 in the second half. It’s uncharted territory for these upstart Ducks. 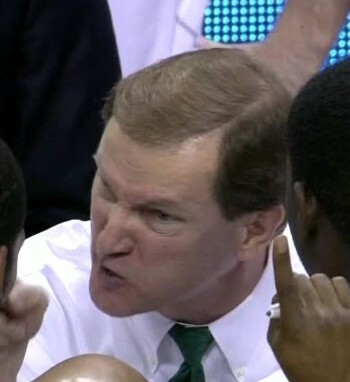 No one in a current Duck uniform has experienced anything quite like this season. 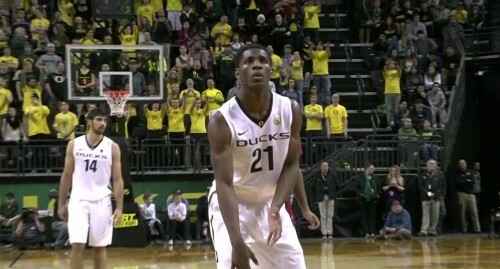 In fact, no Duck basketball player in the past 87 years has gone 6-0 to start a conference schedule. That’s when the Oregon Webfoots opened 10-0, in 1925-26. This Saturday, Oregon plays Washington, sputtering at the moment after two straight losses against Pac-12 cellar-dwellers: Utah at home last week, and OSU, last night in Corvallis. In recent years, the Huskies have been the hunted. This year, however, they are the hunters, chasing the league-leading Ducks.